Polish Talmudist; born at Lublin; died at Lemberg March 29, 1614. His name occurs as "RaFaK" (= "R. Falk Kohen") and "Ma-HaRWaK" (= "Morenu ha-Rab Walk Kohen"). He was a pupil of his relative Moses Isserles and of Solomon Luria, and became the head of the yeshibah of Lemberg. Many celebrated rabbis were his pupils, among them being Jacob Joshua b. Zebi of Cracow, the author of "Maginne Shelomoh." Falk was a great authority on rabbinical matters. At the meeting of the Council of Four Lands in 1607, during the Kremenetz fair, many of his proposals were approved. In 1611 Falk and Enoch Hendel b. Shemariah issued a bill of divorce at Vienna which occasioned lenghty discussions among the celebrated rabbis of the time, including Meïr of Lublin and Mordecai Yafeh (see "She'elot u-Teshubot MaHaRaM," Nos. 123 et seq.). 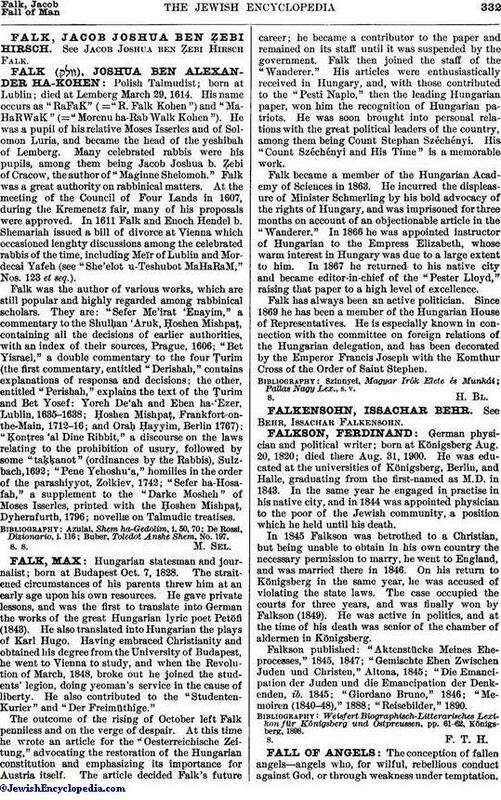 Falk was the author of various works, which are still popular and highly regarded among rabbinical scholars. They are: "Sefer Me'irat 'Enayim," a commentary to the Shulḥan 'Aruk, Ḥoshen Mishpaṭ, containing all the decisions of earlier authorities, with an index of their sources, Prague, 1606; "Bet Yisrael," a double commentary to the four Ṭurim (the first commentary, entitled "Derishah," contains explanations of responsa and decisions; the other, entitled "Perishah," explains the text of the Ṭurim and Bet Yosef: Yoreh De'ah and Eben ha-'Ezer, Lublin, 1635-1638; Ḥoshen Mishpaṭ, Frankfort-onthe-Main, 1712-16; and Oraḥ Ḥayyim, Berlin 1767); "Ḳonṭres 'al Dine Ribbit," a discourse on the laws relating to the prohibition of usury, followed by some "taḳḳanot" (ordinances by the Rabbis), Sulzbach, 1692; "Pene Yehoshu'a," homilies in the order of the parashiyyot, Zolkiev, 1742; "Sefer ha-Hosafah," a supplement to the "Darke Mosheh" of Moses Isserles, printed with the Ḥoshen Mishpaṭ Dyhernfurth, 1796; novellæ on Talmudic treatises. Buber, Toledot Anshe Shem, No. 197.